I've only lived in three places in my life, Minnesota (where I grew up), California, and Arizona (where I am now). And if you've moved around a little in your life, you know that you never quite know how to answer people if they ask where you're from. For a while in California I would tell people I was from Minnesota, but they would ask me about it, and I would realize that I hadn't been there for a long time, and I just decided to tell people that I was from Arizona. Because even though I'd only spent a few years there, it was the most recent place I was from. 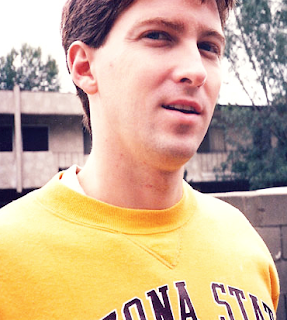 Besides, I had the sweatshirt that said Arizona State University, which I wore just about all of the time. As I'm sure is true everywhere, the locals weren't too crazy about people from out-of-state. I made a point to get a California license plate as quickly as possible. But other than that, I don't remember much animosity towards Arizonans in Los Angeles. Los Angeles is such an international city that simply being from Arizona didn't seem all that exotic. My apartment complex (which you can see in the background there) was the United Nations. People from all over the world lived there. Mostly you heard English and Spanish, but I heard a lot of other languages spoken. I spent seven years in California, and then came home to Phoenix. I like being an Arizonan.